Last week I was scrolling through my Facebook feed in a mindless and uncommitted way. My friends’ profile caught my eye. Now, this particular friend is funny. I’ve known her since college and I associate her with humor so I was excited about what she had posted. 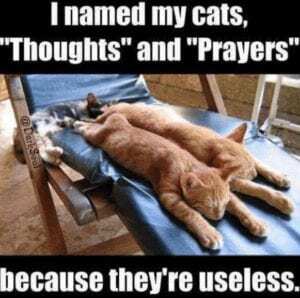 As I took action to zero in on her post, I saw some languidly outstretched cats that immediately made me yawn and the words, “I named my cat’s Thoughts & Prayers.” Aw, that’s nice, I thought to myself. Wait, what? Did I read that correctly? I went back and reread it. Yep, that’s what it said. So I looked to see what my friend had written in association with the post. Her statement was “Where is the lie?”. I immediately raised my hand (literally) and said, I can show you the lie…at least I can show you evidence challenging the truth of that statement. Thoughts, prayers, intentions, and belief to me are synonyms so I was reading evidence to the contrary! I’m in an ether of “intentions matter” so I was shocked when I saw this meme. But it’s Facebook, so I said, “eh” and let it be. 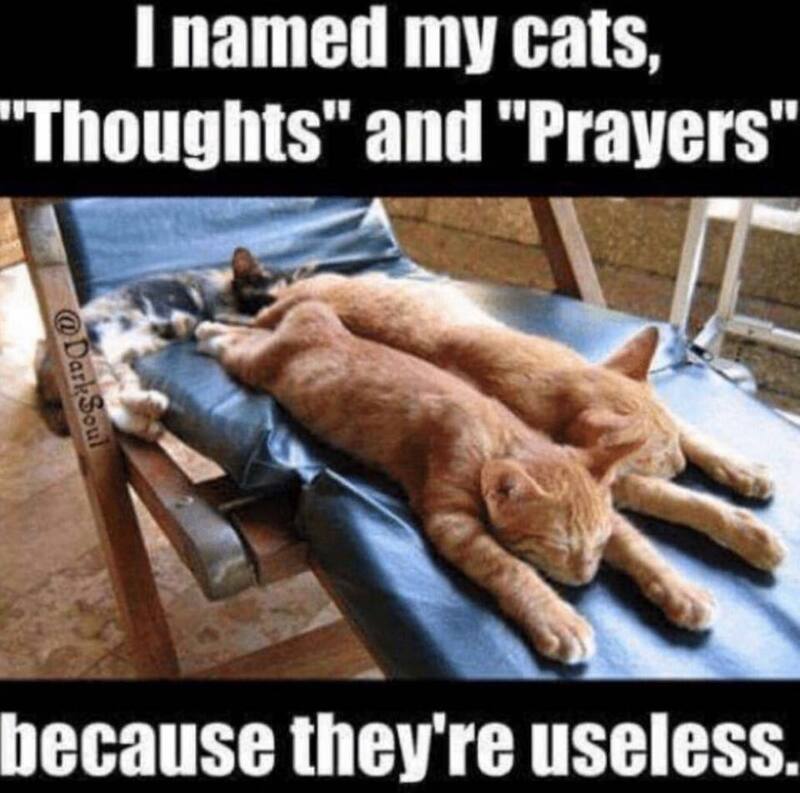 I mean, I know thoughts and prayers have meaning and are useful in a sense. But in reply to the gov’s reaction towards the recent mass shootings, and the reluctance to enact any sort of regulatory change, they’re pretty useless to change the current state of affairs when it comes to gun control. But when a brown man drives a truck into a group of people, they are very swift to want to enact stronger immigration laws. It’s the hypocrisy that I was pointing out. Because while thoughts and prayers and intention may make one feel better, or may make the victims feel loved, an action is much better at bringing about change. How amazing. I was so grateful I had reached out and asked! I had to absolutely agree that in the situation to which she was referring, an action was required. But did that mean that the Thoughts and Prayers were useless? I mulled it over and came to the conclusion that they were certainly not useless. I couldn’t set aside years of researching and practicing mindful and intentional living to let these two cats change my mind. Our thoughts/prayers/intentions play a role in life – in focusing one’s practice, healing one’s maladies, attracting seemingly serendipitous circumstances to name a few ways. But this post and her response reminded me, however, of the importance of actions. I walked into a yoga class an hour later and looked my students in the eye. I told them they weren’t thinking about doing yoga or scheduling it into a calendar stating the intention to go to yoga…this was actually them doing it. An action brings an intention into the tangible realm. 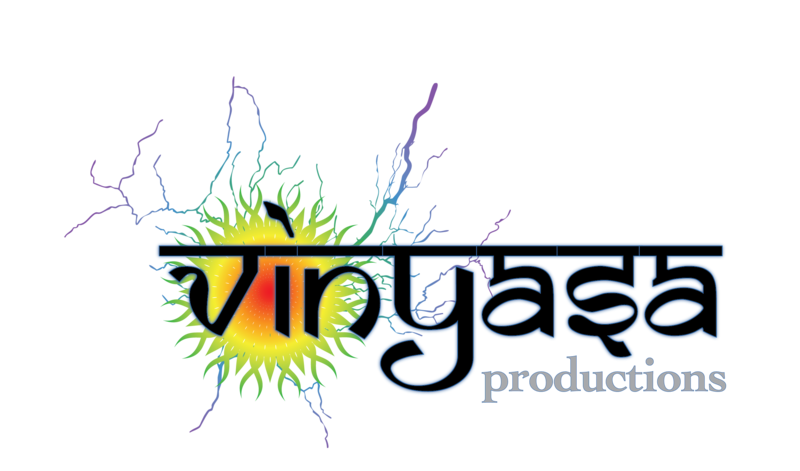 It is manifesting energy and the physical expression. 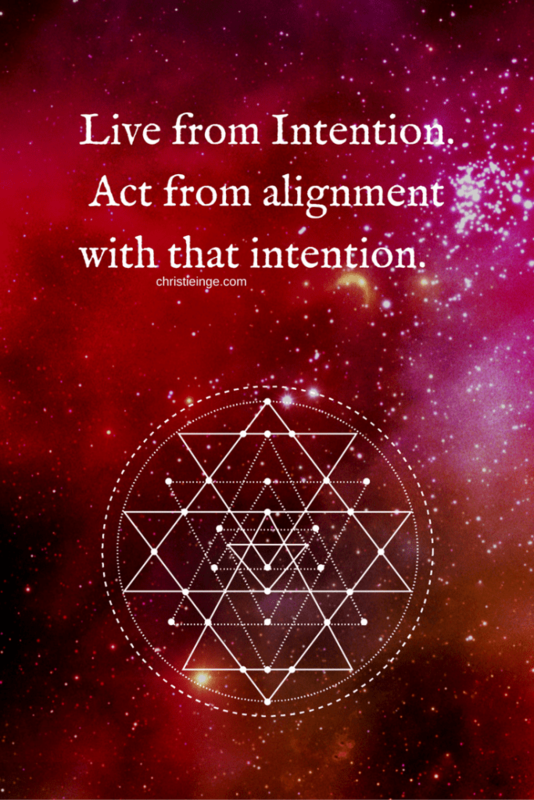 It’s not always enough to just think about our intentions…we actually have to follow through and “do” them. Consider for a moment the beginning of the year when you were writing down your resolutions, creating vision boards, and imagining all that would be accomplished in 2017. 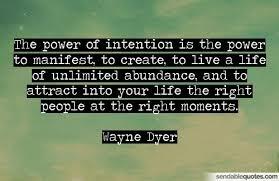 What was on your list of intentions? Consider now the fact that it is mid-November. There are only 7 more weeks, 49 more days, and 1,176 more hours left in 2017 (at the time of writing this). Reconsider those resolutions. What hasn’t been accomplished? What to-do list items are still left unchecked? So while I would wordsmith the language surrounding “Thoughts & Prayers”, Action affects the “intended” change in your/the world. They all play a role in creating our realities. Being mindful and purposeful in our actions weaves a grander tapestry of life.